Panasonic Air Conditioning Systems, a company fuelled by passion and poised to provide customers with effective and innovative solutions, launched the future standard bearer in energy efficient VRF air conditioning solutions - the FSV- Eco Extreme (EX). The system was launched at the Mostra Convegno Expocomfort (MCE) Asia 2015 which took place from 2nd to 4th September 2015. It is the first dedicated trade exhibition for the heating, ventilating, and air conditioning (HVAC), Water, Renewable Energy and Heating Sectors of the green building community in Asia. It has been designed with new all-Inverter compressors that can be independently controlled to deliver highly flexible performances. As a whole, the system has been designed for efficiency – for extremely precise inverter control. The heat exchangers have been redesigned to maximise surface area. Compared to current dual-surface models, there is no division of space and the area for the heat exchanger is much larger, thus allowing for improved heat transfer. The new curve shape of the bell mouth (air outlet of VRF) with integrated top and bottom assures smooth exhaust flow. This provides more air-volume with the same sound level, and less power input at the same air volume! Unlike a regular VRF system that wastes energy by recovering oil from indoor units, the FSV-EX features a 3 stage oil recovery design that’s able to minimise the frequency of forced oil recovery thus leading to reduced energy costs and sustained comfort. During the exhibition, be prepared to feast your eyes on an astonishing state of the art presentation. Panasonic will launch the brand new FSV-EX using advanced 3D projection mapping technology to illustrate the system’s main features and benefits. Other than the cutting edge FSV-EX, Panasonic will also showcase its other commercial solutions such as the Panasonic Smart Cloud, Gas Heat pump VRF system and Air Handling unit kit (AHU kit) for VRF applications, Multi-Split Room Air Conditioner and Single-Split Room Air Conditioner. Panasonic recently announced its global target of ¥700 billion (about USD5.8 billion) in sales for its air-conditioner business in fiscal 2018 (end March 2019), a 52% increase over sales in fiscal 2014. Looking to augment its extensive product line up, Panasonic is keen to expand its large air-conditioner business by offering solutions with efficient use of gas and electricity. 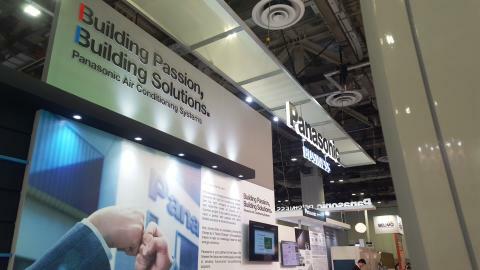 Established in 2015, Panasonic Air Conditioning Systems acts as the 2nd Headquarters for Panasonic Air Conditioning Company under Panasonic Corporation. Panasonic Air Conditioning Systems fully inherits the strengths of PAPAMY (Panasonic Appliances Air-Conditioning Malaysia Sdn Bhd) and PAPASEMY (Panasonic Appliances Air-Conditioning System Engineering Malaysia) by offering the benefits of one-stop convenience to customers. With its world-class air conditioning business centre, Panasonic Air Conditioning Systems offers a wide variety of products to cater to all sorts of preference with varied technological dynamics with the supports of 24/7 customer service team. As the only manufacturer with a VRF factory in Malaysia, Panasonic Air Conditioning Systems alone offers ideal integration of R&D, manufacturing, planning, procurement, sales, logistics, delivery and service, thus maximising its value to its customers.